Our dance season is broken into 3 sessions; Fall, Spring and Summer. Tuition is paid on a full session basis. All classes meet once per week. Drop in class fees are only available for adult classes, summer session and any special event classes. 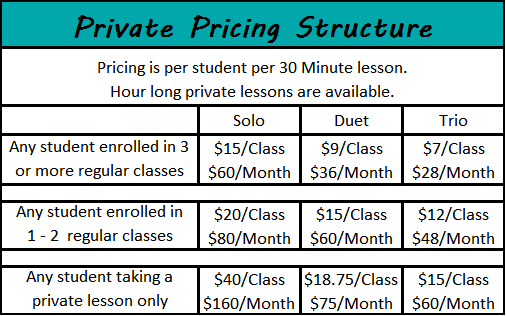 Private lessons, semi-private and trio’s are also available at the rates below. Multiple class discounts apply toward a single student and cannot be applied as sibling discounts. Tuition can be paid in 4 payments. Please see the chart below for dates and amounts. Unlimited tuition can be payed in 7 payments. Please see the chart below for dates and amounts. Students enrolled and actively participating in 5 or more classes may enroll in the unlimited classes option. The unlimited fee is based on the longest class for which you are enrolled. Special classes with guest artists may have additional fees. Late fees will be applied to any late payments. Please see the Studio Handbook for complete details. Private lessons, semi-private and trio’s are available. Fees are the same each month regardless of length of the month. Students are responsible for private lesson fees regardless of their attendance. Miss Lisa and the Lincoln Park Dance Company staff is also available to guest teach at other studios or workshops or for choreography services. Please inquire for pricing. $10 Registration fee due on the first day of class. Max per family $20. $5 One time Non-Resident fee if you do not reside in Lincoln Park. $55 Costume fee per class. This fee is reduced to $50 per class for unlimited students. There may be additional fees for Hawaiian costumes due to inaccessibility of mass produced costumes. Cheer students will pay a $25 uniform rental fee plus a $75 deposit that will be returned when the uniform is returned in full and undamaged. For competition team fees, please see the competition team contract for information. Proper shoes and class uniforms must be purchased for participation. Please see the Class Uniform page for shoe pricing information. Class uniform prices can range from about $20 and up depending on the style leotard you select. If registering for cheer or pom, students are required to purchase poms for $15. Baton students are required to purchase a baton ranging in price from $30 to $40. Some classes may use a prop or accessory not included with the costume generally priced around $10 or less. All students level 2 or higher are required to purchase a choker and earrings as part of their performance wear. The set is $18 including pierced earrings, $20 including clip on earrings. All participants in the holiday performance must purchase a pair of tights at $8. Late fees are charged for any missed due dates for any studio expense. Please see the Studio Handbook for complete payment policies and details.